The basic theory is that Nature knows best. Soil should be improved with compost and other natural organic fertilizers, rock minerals and natural mulches. 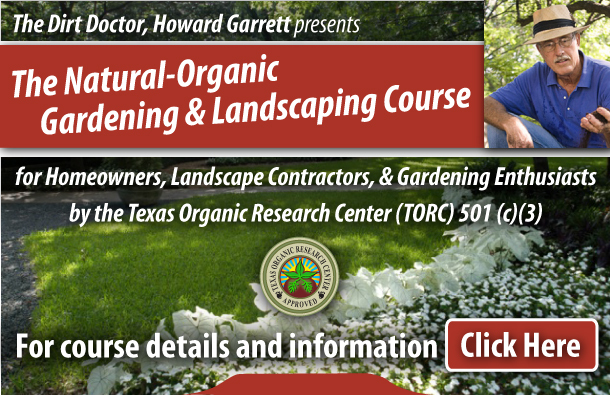 Research exists to back that theory, TORC's job is to provide additional research and classroom education based on current knowledge of natural organic techniques. TORC is a 501(c)(3) non-profit organization. Your contribution is fully tax deductible to the extent provided by law. TORC's tax ID number is: 75-2927872. Please make a donation to TORC today: online ("Buy a Donation") or by US Postal Mail. A non-profit research institute focused on demonstrating the effectiveness of organic approaches in gardening, landscape management and agribusiness. Emphasis is on conducting and facilitating research on organic methods, acting as a clearinghouse for information on organic approaches and increasing awareness through public education. Despite much interest and experimentation in organics, the “Organic Community” has not had the benefit of major funding for research or well-funded lobbyists to spread the word. Organics work better than chemical approaches. Organics are safer and create a more healthful and sustaining environment. As a start-up non-profit, TORC has a variety of needs. Our most urgent need is obtain funding which will be used to continue to develop our educational programs and web site, which will contain all the current research and related information supporting Organic programs. Once funded, TORC plans to establish an office and research facilities. Contact Doug Sheldon for more information on how you can become involved.